NOTRE DAME, IN— The No. 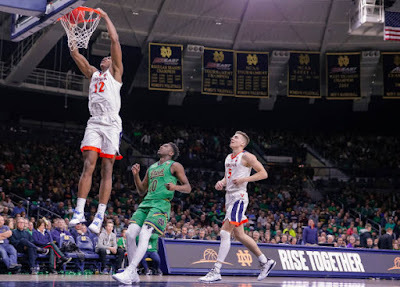 3 Virginia Cavaliers (18-1, 6-1 ACC) proved why they are a threat to make a deep run into March against the Notre Dame Fighting Irish (11-9, 1-6 ACC) on Saturday. Virginia scored off the opening tip and never looked back, routing the Irish, 82-55. Seven different NBA franchises were on hand to take a look at players from Notre Dame and Virginia. Virginia’s De’Andre Hunter is projected to be taken in the middle of the first round in the upcoming NBA Draft. Ty Jerome is another NBA prospect for the Cavaliers and could be taken in the early-to-mid second round. Virginia is known for its stifling pack-line defense and precise offense. That lockdown defense was on full display right from the opening tip. Virginia did not allow Notre Dame to score until nearly 7:30 into the game. During that stretch, Virginia was able to pull out to a 12-0 start and never looked back. At halftime, No. 3 Virginia held a commanding 42-25 lead over Notre Dame. Hunter had 10 points for the Cavaliers, while Kyle Guy led the way with 15 points. As a team, the Cavaliers shot 56 percent from the field for the half, while turning the ball over once. For Notre Dame, John Mooney led the team with seven points and six rebounds in the half. 15 of Notre Dame’s 25 points in the half came from beyond the arc. Notre Dame briefly made it interesting in the second half, cutting Virginia’s lead to twelve on a couple of three-pointers from Mooney and DJ Harvey. Virginia quickly stopped the bleeding and regained complete control of the contest. Mooney picked up his ACC-leading 12th double-double of the season for Notre Dame. On the afternoon, Mooney finished with 15 points and 10 rebounds. Mooney was the lone player for the Irish to score in double figures. Mamadi Diakite had an impressive showing in the second half for Virginia. The redshirt junior made his presence known on the defensive end, swatting three shots in the second half. Diakite showed some versatility on the offensive end of the floor as well by stepping out and knocking down a three pointer. As a team, Virginia finished a point shy of tying its ACC-high in scoring this season. Five different Cavaliers scored in double figures, including Kihei Clark, who scored 12 points off the bench. Guy, an Indiana native, finished with 15 points while Hunter finished with 19. Ty Jerome finished a rebound short of a double-double for Virginia, while also leading the Cavaliers with six assists on the day. “All those people have watched him since he’s been, you know, grade school and junior high player into high school and college and they watched him do what he did today: Shoot that ball. He’s got a beautiful stroke, quick release,” said Virginia coach Tony Bennett. Notre Dame will remain in South Bend, but its matchup on Monday night does not get any easier as the No. 2 Duke Blue Devils come to town. Virginia will head to Raleigh, North Carolina to take on the No. 21 North Carolina State Wolfpack on Tuesday night.